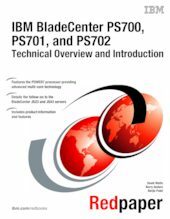 The IBM® BladeCenter® PS700, PS701, and PS702 are premier blades for 64-bit applications. They are designed to minimize complexity, improve efficiency, automate processes, reduce energy consumption, and scale easily. These blade servers are based on the IBM POWER7™ processor and support AIX®, IBM i, and Linux® operating systems. Their ability to coexist in the same chassis with other IBM BladeCenter blades servers enhances the ability to deliver rapid return of investment demanded by clients and businesses. This IBM Redpaper™ is a comprehensive guide covering the IBM BladeCenter PS700, PS701, and PS702 servers. The goal of this paper is to introduce the offerings and their prominent features and functions.